Town Hall in Fort, Mumbai. Shahid Bhagat Singh Road, Fort, Mumbai. The Asiatic Society of Mumbai (formerly Asiatic Society of Bombay) is a learned society in the field of Asian studies based in Mumbai, India. It can trace its origin to the Literary Society of Bombay which first met in Mumbai on 26 November 1804, and was founded by Sir James Mackintosh. It was formed with the intention of "promoting useful knowledge, particularly such as is now immediately connected with India". After the Royal Asiatic Society of Great Britain and Ireland was established in London in 1823, the Literary Society of Bombay became affiliated with it and was known as the Bombay Branch of the Royal Asiatic Society (BBRAS) since 1830. 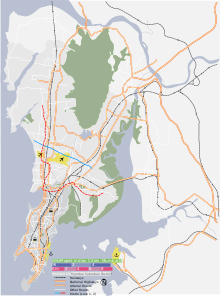 The Bombay Geographical Society merged with it in 1873, followed by the Anthropological Society of Bombay in 1896. In 1954, it was separated from the Royal Asiatic Society and renamed the Asiatic Society of Bombay. In 2002, it acquired its present name. It is funded by an annual grant from the Central Government of India. One of only two known original copies of Dante's Divine Comedy. The manuscript of Vasupujyacharita (1242), a Sanskrit text on the life of the Jain Tirthankara Vasupujya. The manuscript of Shahnama of Firdausi (1853), written in Persian. The Aranyakaparvan (16th century) manuscript contains illustrated text from the Mahabharat and is written in Sanskrit. Five Buddhist caskets excavated in the ancient port town of Sopara near the suburb of Nala Sopara. The manuscript of the Divine Comedy, a poem composed by Dante Alighieri in the 14th century, was written in the second half of the 15th century. It is a beautiful codex on parchment and richly illustrated. It was given to the Society by Mountstuart Elphinstone, governor of Bombay and President of the Society from 1819–1827 and bears his signature. In 1930, the Italian government under Benito Mussolini offered the society one million pounds, calling the book a national treasure. Mussolini believed that the offer could not be refused, but to his shock, the Society turned down his request stating that it was donated by an ex-member of the Society and hence it was their property. Holding: Preserving, conserving, cataloguing and documenting holdings. Research: Generating supporting and disseminating research in its chosen fields. Public interface: Providing a forum for debate and discussions on topics of public interest. The adopt-a-book scheme was recently introduced by the Society which allows patrons to fund the upkeep of rare books. The Society is financially in the red with a loss of Rs 1 crore (10 million). Due to the availability of information from the internet, membership has dropped significantly in recent years. Initially, the Literary Society of Bombay published its transactions under the title, Transactions of the Literary Society of Bombay. In 1841, the Asiatic Society of Bombay commenced publishing its journal titled, Journal of the Bombay Branch of the Royal Asiatic Society. From 1955 to 2002, it published its journal under the name, Journal of the Asiatic Society of Bombay and from 2002, its journal has been published under the name, Journal of the Asiatic Society of Mumbai. The Campbell Memorial Gold Medal was established in 1907 and is awarded to recognize distinguished services on the subject of Oriental History, Folklore or Ethnology which further the investigation and encouragement of Oriental Arts, Sciences and Literature. The first winner was archaeologist Aurel Stein in 1908. Established in 1946, the medal is awarded for valuable research work in Vedic Studies or in Classical Sanskrit with special reference to Dharma Shastra and Poetics. The Silver Medal is awarded to a member of the Society who has written a book adjudged as the best in the given 3-year period. The Town Hall (colloquially Called "Tondal" in the 19th century) that houses the Asiatic Society of Bombay was not built in 1804, the year in which the Literary Society of Bombay was formed. Though Sir James Mackintosh mooted the proposal for a grand edifice, it was not completed until the year 1833 after many fits and starts, when the Government of Bombay agreed to make up for the shortfall in funds in return for office-space. The after-effects of this compromise can still be seen in the unseemly crowds gathered at the Stamp Office and other government departments in the Town Hall. It is now classified a heritage structure. Heavily influenced by Greek and Roman architecture, it has a portico with eight Doric columns. A flight of 30 steps lead up to the town hall and a wrought iron divided Regency staircase leads to the vestibule. In 1830 Sir John Malcolm, governor of Bombay stated: "It is the most magnificent structure that taste and munificence combined have as yet erected in India." The edifice is in the prime Fort area of South Mumbai overlooking the Horniman Circle Gardens and the Reserve Bank of India. Wikimedia Commons has media related to Asiatic Society of Mumbai. ^ a b c d Bavadam, Lyla (8–21 May 2010). "Treasure house". Frontline. 27 (10). Retrieved 21 May 2010. ^ "Honorary Fellowships and Medals". The Asiatic Society of Mumbai. Retrieved 1 December 2014.